The complex boasts a crystalline facade with 20 types of glass, including two five-story suspended glass curtains; a Brazilian tropical hardwood ceiling; glittering aluminum-leaf “air columns” by the award-winning environmental artist Ned Kahn, and landscaping with more than 30 varieties of drought-tolerant plants. It resulted from a public-private development deal with high-profile contractors that includes a service contract leaving Golden State residents on the hook for $53 million in annual costs for 35 years. The local courthouse came “at a cost so exorbitant that it has resulted in many counties needing courts and not getting them,” said Sacramento-based Superior Court Judge Steve White, president of the 500-member Alliance of California Judges, a watchdog group founded in 2009 to check the bureaucrats of the Judicial Council, the policymaking body of the California courts. It has 16 superior court judges among its directors. The lead architect and project manager of the project, Clifford Ham, concedes the courthouse “wasn’t cheap.” But Ham, who oversees California court administration and construction, said partnering with the private sector ensured the project wasn’t beset by the delays and overruns typical in government work and the public got long-term value for its money. The courthouse was the brainchild of former Gov. Arnold Schwarzenegger, who favored enlisting the private sector to pay for government operations at the time of the 2008 fiscal crisis. Unlike other court building projects, financed by bonds subject to approval by voters or appropriations by the legislature, the Long Beach courthouse was made possible by 2007 legislation allowing public-private partnerships for courthouse construction. 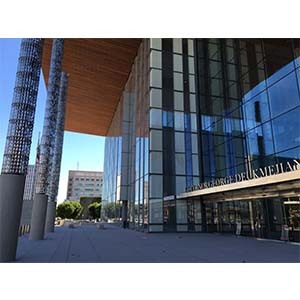 The result was the 531,000-square-foot complex in Long Beach, which boasts 31 courtrooms with 416,000 square feet of court space. It cost $490 million to build, but annual expenses per courtroom are expected to top $1 million, according to Superior Court Judge Runston Maino of San Diego. That’s about 30 percent higher than comparable courtrooms built with traditional bond financing around the same time in San Diego, he said. The courthouse’s construction cost $1,179.25 per square foot, compared with the average cost of $591 per square foot for California courtrooms calculated by the Judicial Council. On its website, the Judicial Council notes that the project was completed 11 days ahead of time and came in slightly under budget. Yet it is still among the most costly public projects in California history. It even stacks up against some of the costliest buildings in the world, although it’s hard to compare one megaproject with another. The world’s tallest building, the 154-story, 2,717-foot Burj Khalifa in Dubai, completed in 2009, cost $1.5 billion to build. But the Long Beach complex’s projected $2.08 billion cost comes mainly from its service contract, calculated in the deal at about $53 million per year over 35 years. The state will pay that to Meridiam Infrastructure, a Luxembourg-based private equity developer that put up $49 million for construction, the remainder of which was financed through debt sold to investors. The interest rate paid – around 7.45 percent to 8.45 percent – was higher than many municipal bond issues. Ham pointed out that the financing was arranged at the peak of the global financial crisis around 2008-2010 — when U.S. banks were refusing to lend — with a European and Canadian bank consortium still willing to lend at higher rates. Under the deal, Long Beach Judicial Partners LLC — a five-company consortium put together to finance, design, build and operate the complex — will have to keep the building maintained and in pristine condition until they turn it over to the state in 35 years, or else their fees are cut. A complication is that the state must pay that $53-million service fee or Meridiam can evict it like a bad tenant and hold onto the building for 50 years instead of 35. There is no flexibility as in the case of bond financing. That leaves Californians on the hook for around $2.08 billion over 35 years, according to a study of the case from George Mason University. But chief architect Ham said that figure was a “red herring.” He said such estimates neglected to factor in the normal depreciation of the dollar, given that the amount was stretched over decades. It would amount to about $750 million in today’s dollars, he said. He added that the consortium’s obligation to maintain the complex was valuable over the long term, a major departure from the costly political practice of deferring maintenance to spend money elsewhere. The California justice system is the largest in the nation, serving 38 million citizens, or about 12 percent of the U.S. population, according to the state’s website. Cutbacks in recent years have forced more than 50 courthouses and 200 courtrooms to close and scores of others to reduce hours or services. At least two courthouses in Kern County have been scrapped since construction of the Long Beach edifice. The Judicial Council and its administrative office have come under heavy fire from the California state auditor for problems seen frequently in the state’s government: staff salaries higher than that of the governor; fleets of unnecessary state cars; expensive payments to consultants; over-payments to contractors; and pricey headquarters in tony locations such as San Francisco rather than the less costly state capital, Sacramento. Using faulty assumptions about costs, the Judicial Council may have spent as much as $160 million more than necessary, according to a California State Legislative Analyst report released in 2012. Ham countered that the deal was made with the best information available at the time, and the process is being fine-tuned as more institutional knowledge is accumulated. “We did a cost-effect study comparing Long Beach to 30 other court projects with traditional financing,” he said, and found it was about even with the costs of the traditionally financed San Bernardino courthouse construction around the same time. Public-private partnerships (or P3s, as they are called) have often been promoted as an easy way for cash-strapped or bankrupt polities to continue funding public projects. But the reality is complex. In Long Beach, “the delivery method relieved the state of upfront investment,” Scott Blair, deputy editor of Engineering News-Record California, wrote in 2014. The chief architect in Long Beach would not do another public-private venture. The real problem, Ham said, is that public-private financing, unlike bond issues, is continuously exposed to the political process. Securing yearly appropriations for the multimillion-dollar service fee is “a tough sell with the legislature,” said Ham.